It is finally slipping into “winter” (by Indian standards), with the pollution smog haze rarely lifting, and somehow the weather and climatic conditions seem to be influencing whisky preferences… to peat. 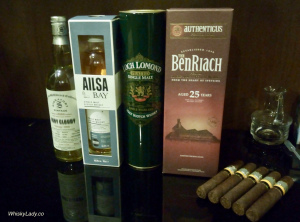 And no ordinary peat… an exploration of a few whiskies one would not normally have on the top peat picks list from regions not immediately associated with peat. Because why should our familiar friends over in Islay corner the market when other options exist? As this was a BMC session, we had no pretence of hiding the bottles… instead merrily dove in to our discoveries eyes wide-open! Our host shared that it began with acquiring the BenRiach 25 year peated… and morphed from there… each selected to be peat with a twist. Then it continued with Loch Lomond – again not normally peated…. So why Ledaig you may ask? By their “nature” Ledaig is Tobermoray’s peaty whiskies. Yes indeed. However the “Very Cloudy” Vintage 2008 is known to have a lighter dusting of peat rather than full force peat one normally associates with a Ledaig…. Then our evening closed with cigars. How perfect! This entry was posted in Highland, Island, Lowlands, Scotland, Speyside and tagged Alisa Bay, BenRiach, Ledaig, Loch Lomond by Carissa Hickling. Bookmark the permalink.